This morning I met up with an Aussie friend of mine for brunch. S travels a lot for work and since he has the next 2 weeks in London before his next round of jet-setting, we decided to grab the bull by the horns – so to speak – and catch up over some scrumptious vittels and good coffee at The Modern Pantry in Clerkenwell. S and I used to work together and as such, he is a fellow afficionado of both the Melbourne coffee scene and that bastion of Italian yummy-ness, Lygon Street. Way back when we worked together, we were fortunate enough to share premises with the barista training school of a very well-known Italian coffee brand. As such, there was no schlepping around with freeze-dried instant or filter coffee for us. It was punchy espresso with gorgeous caramel-coloured crema, warm milky-smooth lattes and luscious foamy (not frothy people – there’s a world of difference) cappuccinos. Let me tell you, we knew our Robusta from our Arabica. Then we came to London. And caffeine confusion reigned. You see there are two types of coffee that are ubiquitous in the Land Down Under (and for that matter, in the Land of the Long White Cloud) but as rare as hen’s teeth in Ol’ Blighty. The first is the Flat White. It lies somewhere between a warm milky latte (a flat white has less milk and is served hot) and the foaming cappuccino (the flat white has less/no foam). It’s hard to find in London but with the likes of The Australian Times providing a handy list of good flat white-rs in London Town alongside a little Antipodean word-of-mouth, it’s possible. But most places here will translate the Flat White into a white coffee (a black coffee with cold milk), completely ignoring the craft of creating a steaming Long Black before adding a large dollop of warm milk. 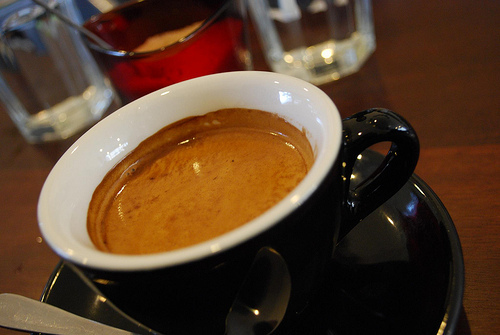 Which brings me to my second point – the Long Black. In non-barista terms, it’s a shot of espresso poured into hot water to preserve the crema. Simple right? Not nearly as complicated as the Flat White one would think. Just ask for a Long Black here and watch the bewilderment appear across the face of one’s waiter. Then try to explain it ie. a shot of espresso with hot water (and that’s not getting into the size of the cup it should come in). In most places, the response is ‘oh so you want a black coffee?’ No. Not if you are going to stick my cup under the coffee filter for 5 minutes. Some will respond by correcting you calling it an Americano, grinning proudly at you as they successfully navigate the lingo of yet another of the half million or so Antipodean immigrants living in London. Well no actually – but at this stage, an espresso topped up with hot water is starting to sound like an acceptable (and considerably less stressful) compromise. But all I really want is a proper Long Black. I want a lovely shot of espresso – that’s right, like you normally give one who orders an espresso – poured into the cup with hot water. Rich and smooth with a velvety crema. No bitterness, no acrid aftertaste. Understated yet still packing a caffeine punch. Just like the one this morning. Anna Hansen may have been ‘chef-fing’ all over the globe – and let me tell you the food was really, really good – but for the coffee alone , The Modern Pantry gets my vote. Smooth, rich and velvety. Exactly the way I like it. This entry was posted in Australian Abroad, eating out, Expat moments, Melbourne and tagged Anna Hansen, Australian Times, coffee, Melbourne, New Zealand, The Modern Pantry by Kym Hamer. Bookmark the permalink. I'll be in Oz later in the year Gina so last week's espresso filled Roman holiday will have stand me in good coffee stead until then. Having lived in the UK and now in Australia I understand your confusion, but backwards! I love the coffee here in OZ and am sure I would find it hard if I had to go back again to the UK coffee menu! Thanks Jane. Glad you enjoyed the post! Ah Cathy I think you'll have been spoilt forever. I'm not sure to be honest. When I first came over I went to Bar Italia – the supposed denizen of excellent Italian-style coffee – and was bitterly disappointed. I'm in Rome week after next so I'm looking forward to wallowing in some good espresso! If anyone else can suggest anywhere for Cathy (and me), please leave some details for us! I've been spoilt by living in Italy for the past six years, being the land of excellent coffee. A couple of weeks ago I had an awful coffee here in England, the coffee was burnt. Do you have any suggestions of where I should go to drink good Italian style coffee in England? Interesting New Aussie. I used to work for the Australian distributor for Lavazza (Valcorp, head office in Melbourne). Do Lavazza use someone different now? If you want I can always put you in touch with someone at Valcorp…still have a few old contacts! Yep, you're right; the flat white is a great invention. The trick is to “stretch” the milk rather than froth it. Of course, everything is predicated on the underlying espresso being of great quality and having the crema. I've just switched to getting my beans delivered from Melbourne (to Sydney) after realising that, as much as I like Lavazza in Europe, they only ship beans here once or twice a year and beans do go stale.